I have been very, very busy these days with several projects (a culinary dictionary is one! ), so deserved a grown-up meal made by my own loving hands. But it also had to be something not very involved that I could sling together fast, because just don’t have enough time for everything I’d like to do! Whether you are doing the Lenten fish on Friday thing or just happen to have some extra cooked shrimp from a buffet table or recipe, or just defrosted some shrimp that you didn’t get a chance to use and want to do something fun with (and that you have absolutely no intentions of sharing with your spoiled little son for whom you do too much anyway and whose leftovers you are sick of picking at instead of making something proper for yourself)….this is a very simple recipe that looks and tastes like a million bucks. In an avocado shell or on a tostada...this salad looks as good as it tastes! 1 ripe avocado, sliced in half. Scoop out flesh (discard stone) carefully and cut into small chunks. Reserve shells. Whisk dressing ingredients in a small bowl until incorporated. Place shrimp, onion, and tomatoes in a medium bowl. Cover with dressing and stir gently. Then add avocado chunks and stir once again, very gently. Scoop salad into reserved avocado shells (or onto tostadas. Finish with lime and salt and serve. SOPHISTICATED TAKE ON GUACAMOLE AND SHRIMP! Veo que estás muy ocupada, pero ahí lo dejo para cuando tengas tiempo. Mmm chipotles – always such a great addition for flavor! I love the title with “chipotle-spiked”! I just discovered chipotle in adobo about a year ago and I am IN LOVE!!!! Mmmmm. 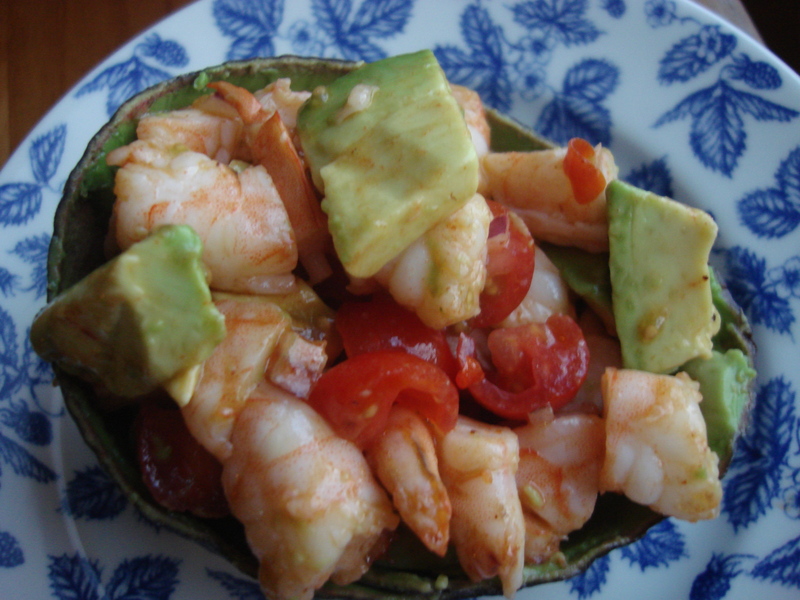 Shrimp and avocado….one of my fave combos ever…..
It’s also one of my faves! thanks for the visit and the kind words! 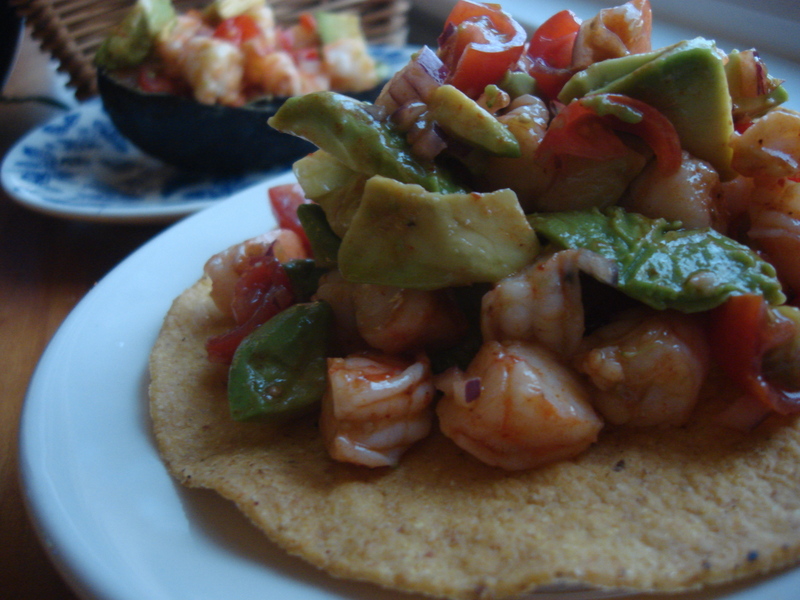 Shrimp and avocado… always delicious!